This week, a group from Sheridan will join with others from across the United States to help serve and lead a Vacation Bible School in Jacmel, Haiti. This year, our theme is God’s Good Creation teaching on the goodness of God in and through the gifts of creation. Haiti suffers from a fragile environment. Located on the same island as the Dominican Republic in the Caribbean and is vulnerable to hurricanes and tropical storms. Hurricane Matthew devastated the western side of Haiti last year. During our week, students will learn about the conservation of resources, disaster preparedness, composting, pollinators, gardening, scriptures that highlight God’s creative acts in Genesis and how we are called to be good stewards of the earth. More than 300 Haitian children will attend, learning of God’s love in their lives and more than 50 Haitian leaders join our teams to lead this amazing experience. After we’ve returned home, the local Haitian leaders will distribute 30 lb. bags of rice to the families who sent children to VBS. This rice will help feed their family for the remaining months of summer. 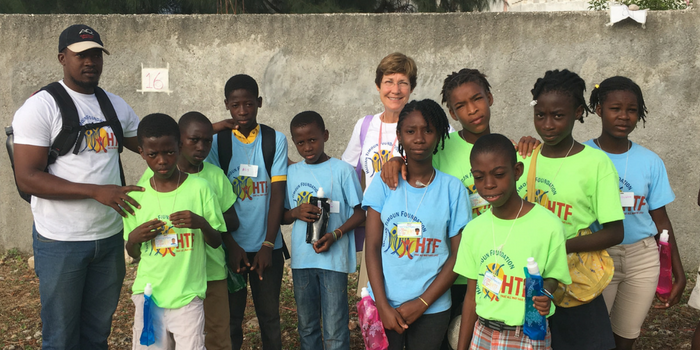 Sheridan’s Haiti mission team includes Pastor Rhonda Bostrom, Alex Bouvier, Kathi Hesser, Mike Hesser, Kristen Pfeil and Jody Simeck. This camp is possible because of your generosity through Magnificent Gifts. Thank you!